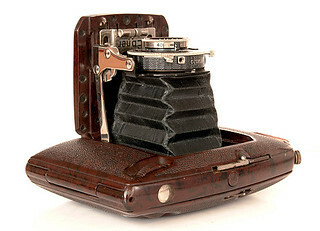 Albert Ebner & Co. were a German record-player manufacturer based in Stuttgart - Vaihingen, who also made elegant folding cameras from Bakelite. The Ebner was made in two sizes, 4.5×6cm and 6×9cm and were available in black or brown. The cameras varied in complexity, some with simple three-speed Pronto shutters, some with multi-speed Compur items. McKeown lists several lens/shutter combinations for both sizes. 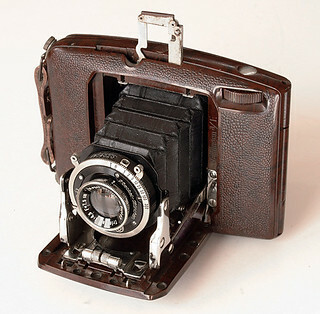 The 4.5×6 model used 620 film, the 6×9 model used 120 film. The company went out of business in 1935. The cameras seem to have mostly sold in Germany. 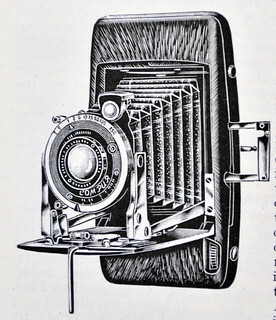 The Gallus Bakélite and Pontiac Bakélite cameras were similar to the 6×9 Ebner. ↑ McKeown, James M. and Joan C. McKeown's Price Guide to Antique and Classic Cameras, 12th Edition, 2005-2006. USA, Centennial Photo Service, 2004. ISBN 0-931838-40-1 (hardcover). ISBN 0-931838-41-X (softcover). Page 254.